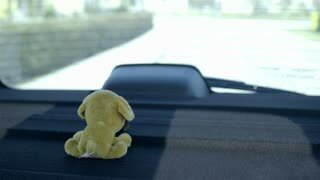 Search Results for "stuffed toy"
Dog toy alone on back shelf of car 4K. Cute little puppy stuffed toy looking through back window while driving on road on a sunny day. A young guy buys a stuffed toy. Stuffed toys bunny duck in kitchen. Playing in a kitchen with the stuffed toys of a bunny and a duck. 1950s: Baby sits near stuffed Santa Claus toy. Man wiggles stuffed toy near baby. Baby sits near pillows. A sleeping child is hugging a toy. A little girl is hugging a stuffed toy. A child is hugging a toy. Hands of a little girl hugging a stuffed toy. Little girl loading her stuffed toy to washing machine. View from the inside of washing machine. Bookshelf with teddies and various stuffed toys. 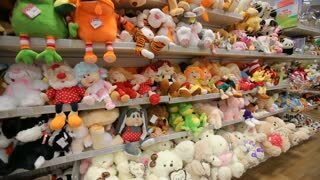 Stuffed toys sitting on a bookshelf. Close up pan left to right. Three Caucasian people in hospital room. Serious doctor with beard listening to little girl with stuffed toy, using stethoscope. Mother and daughter. Young attractive unhappy woman with long brown hair sitting near daughter. Little sick girl hugging beautiful big stuffed toy. Two women in clinic. Attractive kind doctor with beard listening to little sick girl, using medical equipment in hospital room. Physician giving prescription. Stuffed toy. Indoors. Little pretty lady with European appearance laying on bad with IV fluids. Ill girl with stuffed toy spending time in hospital. Infection. Rehabilitation. UNITED STATES 1950s: A young girl talks to her stuffed toy as she stays isolated in her room to prevent passing her measles. Young sick girl laying on bad and hugging stuffed toy. Doctor giving pills to patient’s mother. Three Caucasian people in hospital room. Good-looking Caucasian man with beard listening to little patient. Cute girl with stuffed toy sitting on hospital bad. Smiling. Conversation. Indoors. Young ill girl with nice big stuffed toy looking attentively at camera. Patient with sad smile. Mother and medical worker talking in the background.